I bought my early bird ticket for the Independent Fashion Bloggers Conference, being held September 7, 2011, in New York City. I'm so excited! I hope to meet a few of my favorite bloggers like Vahni of Grit & Glamour, Bella of The Citizen Rosebud, and Elissa of Dress With Courage. I also hope to learn anything I can about technology as it pertains to blogging, since I feel I am always playing catch up on that subject. The same day as the IFB Conference, one of my favorite designers, Valentino Garavani, will be honored with the 2011 Couture Council Artistry of Fashion Award, given by The Couture Council of The Museum at the Fashion Institute of Technology. If I had $1,000 to spare (the price of a "Fashionista Ticket," which includes seating and listing in the invitation), I would have to skip a couple of hours of the IFB Conference (sorry!) to attend this luncheon honoring Mr. Valentino, whose work I have long admired. 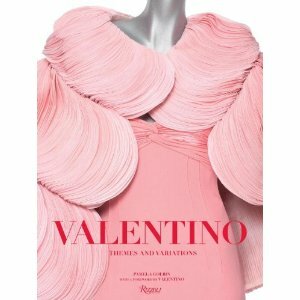 Since that's not happening, I will console myself with having gotten the IFB Conference ticket at the nice price and having a look through Valentino: Themes and Variations, by Pamela Golbin. Valentino with Anne Hathaway earlier this year at the Oscars, Anne in vintage Valentino red. Photo by John Shearer/Getty Images. Now to the question that strikes fear in my heart: what do you wear to a fashion blogger conference (or to meet Valentino)? I am so jealous of the IFB conference...so wish I could join you ladies!!! I will have to experience through your blogs!! I can't wait to hear about the IFB conference! How exciting! Yay! I so excited to meet you and so many others too! RED, definitely red! or rich orange... it's the new red - hah! Like I know! I hope that you have a fabulous time and I know how fun it is to meet bloggers and people you have met online. I can't wait for the photos! I'm very excited to hear all about the IFB conference. I think it'd be star-stuck and afraid to try and strike up a conversation with those titans of the blog-sphere. Please come back and tell us all about it. Hi Pam, I wish you were coming to this conference so I could meet you. I want to try to meet as many of my favorite bloggers as possible! Hi Adrienne, this will make you laugh, but I never know what to wear to any of these kinds of things--Fashion's Night Out, costume exhibits, etc. I get too nervous to plan a great outfit. Wish you were here so I could run some outfits by you! Hi Vahni, it will be so great to meet you and the other ladies whose blogs routinely brighten my days. Hi Genie, red, yes, good idea, I think I have a skirt with some red in it. Otherwise, so much of my wardrobe is black, navy and white. A pop of red will be good! I can't wait to share pictures with everyone. Between the conference and Fashion's Night Out the next day, it's going to be quite a week! Hiya Northeast Chic, I will be a little shy to meet the other bloggers at first, though hopefully not as starstruck as when I was so close to Anna Wintour this past May. I froze, I couldn't believe I was seeing her in person! Oh Veshoevius, boo-hiss, I was hoping to hear about the London conference from you! Are you sure you don't want to play hooky from work for the day to attend? Hi Bella, I can't wait to go to the pre-IFB Conference meet-up with you. It's going to be so fun! So jealous you're going! I am looking forward to living vicariously through your Twitter feed + blog posts! Hi Hallie, thanks for joining my blog! You had me when you showed those gorgeous closets on your blog, they were very inspiring. I will definitely be blogging about all the festivities surrounding the IFB Conference and Fashion's Night Out!